Help to protect yourself, your family, and your local community from the threat of Synthetic Drugs by providing tips to the Drug Enforcement Administration (DEA). Synthetic Drugs, also referred to as New Psychoactive Substances, represent an emerging and ongoing public health threat in the United States. Synthetic Drugs may have cute names like Green Giant, Joker, N-bomb, or Flakka. Some may be sold in colorful little baggies at gas stations and convenience stores or as a street deal like other illegal drugs. Individual products can contain a vast range of different chemical formulations and potency. Consuming these Synthetic Drugs can cause severe symptoms to include seizures, psychotic episodes, suicidal thoughts, and even death. 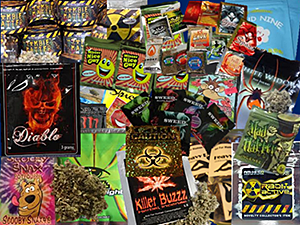 Many of these Synthetic Drugs are controlled under federal law which makes manufacturing or distributing them a prosecutable offense, even if it is sold as an over-the-counter item. Recently, a Connecticut man was sentenced to a total of 1,440 months in federal prison (over 100 years) for selling Synthetic Drugs over the internet. DEA continues monitoring for new Synthetic Drugs. You can help make a difference by letting us know what is out there.